Geoscience researchers at the University of Massachusetts Amherst, Smith College and the Japanese Agency for Marine-Earth Science and Technology this week unveiled new, GPS-based methods for modeling earthquake-induced tsunamis for southeast Japan along the Nankai Trough. A Nankai-induced tsunami is likely to hit there in the next few decades, says lead author Hannah Baranes at UMass Amherst, and has the potential to displace four times the number of people affected by the massive Tohoku tsunami of 2011. She and her doctoral advisor Jonathan Woodruff, with Smith College professor Jack Loveless and Mamoru Hyodo at the Japanese agency report details in the current Geophysical Research Letters. Baranes says, "We hope our work will open the door for applying similar techniques elsewhere in the world." As she explains, after the unexpectedly devastating 2011 quake and tsunami, Japan's government called for hazard-assessment research to define the nation's worst-case scenarios for earthquakes and tsunamis. Baranes notes, "The government guideline has focused attention on the Nankai Trough. It's a fault offshore of southern Japan that is predicted to generate a magnitude 8 to 9 earthquake within the next few decades." The team's research, supported by the National Science Foundation and a NASA graduate fellowship, began with a study of coastal lake sediments in Japan to establish long-term records of tsunami flooding. Between 2012 and 2014, Baranes and Woodruff collected sediment cores from lakes, looking for marine sand layers washed onshore by past extreme coastal floods. "These sand deposits get trapped and preserved at the bottoms of coastal lakes," she says. "We can visit these sites hundreds or even thousands of years later and find geologic evidence for past major flood events." Results from Lake Ryuuoo, a small lake on an island in the Bungo Channel, show a surprising sand layer washed into Lake Ryuuoo by seawater rushing over a 13-foot-high barrier beach. "We were able to date the layer to the early 1700s, which is consistent with the known Nankai Trough tsunami event of record from 1707," Baranes says. She adds, "We were a bit puzzled. The Bungo Channel is tucked between two of Japan's main islands and is relatively sheltered from Nankai Trough-generated tsunamis. Given recent tsunamis in the region, a minimum 13-foot tsunami in the channel seemed very unlikely." Further, she points out, the Bungo Channel area today has much sensitive and critical infrastructure, including the only nuclear power plant on the island of Shikoku. 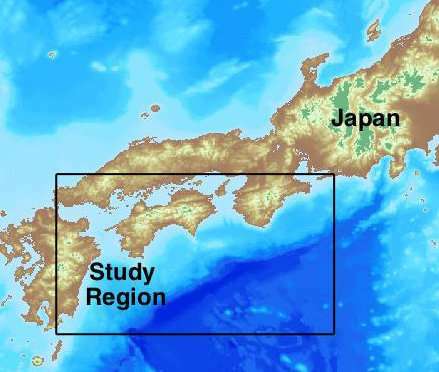 This gave the researchers "particular concern" for tsunami hazard there, so they decided to investigate their original finding further using numerical modeling techniques. As Baranes explains, an earthquake is caused by plates slipping past each other along faults in the earth's crust. That slip causes the earth's surface to deform, to uplift in some places and sink, or subside, in others. "When earthquake-induced uplift occurs on the sea floor, it displaces the entire column of water above it and generates the wave that we call a tsunami," she adds. "We can simulate that process with numerical models." She and Woodruff tried using one of the most widely-cited models for the 1707 Nankai Trough earthquake to flood Lake Ryuuoo, but this only generated a six-foot tsunami that came nowhere near overtopping the 13-foot barrier beach. "At that point, we were still stumped," says Baranes. "But it wasn't long before we had a stroke of good luck in learning that a leading expert on tectonic modeling in Japan, Jack Loveless, is a professor just down the road at Smith College." Loveless uses very precise GPS measurements of earth surface motion to model the extent and spatial distribution of frictional locking that causes fault stress to build up between earthquakes. With Loveless, the team created earthquake scenarios based on GPS estimates of present-day frictional locking along the Nankai Trough and for the first time rigorously tested methods for creating potential future earthquake scenarios from the GPS measurements. They tested various methods for creating a suite of GPS-based earthquake scenarios and simulated the resulting ground surface displacement and tsunami inundation. Baranes reports that they found GPS measurements of present-day earth surface motion around the Nankai Trough yield an earthquake of a similar magnitude and extent as the 1707 event, and their simulated tsunami heights are consistent with historical accounts of the 1707 event. As for matching the Lake Ryuuoo geologic record, she adds, "Our model earthquake scenarios showed the Bungo Channel region subsiding seven feet and lowering Lake Ryuuoo's barrier beach from 13 to six feet, such that a tsunami with a feasible height for an inland region easily flooded the lake." Woodruff, who conducted the study as part of a Fulbright fellowship, says, "Although our methodology was well received, our result for the Bungo Channel was met with a lot of skepticism. We needed to find an independent method for validating it." They enlisted Hyodo, who had previously published earthquake scenarios based on models of the Nankai Trough's physical characteristics. His physical model yielded the same focused subsidence in the Bungo Channel, Woodruff reports. Baranes adds, "His model was also consistent with our GPS-based model in terms of earthquake magnitude, ground surface displacement and tsunami inundation. This was a really neat result because in addition to providing an independent line of evidence for significant tsunami hazard in the Bungo Channel, we demonstrated a connection between the Nankai Trough's physical characteristics and GPS measurements of surface motion."